Home > Articles > 607 > Are You Interested in Tomato Grafting? ​You might have heard about tomato grafting, or you might even already have tried the new technique. Yes, it has multiple benefits: control of soilborne diseases, enhanced tolerance to abiotic stresses, and increased productivity. It works for some growers, but not all. Why? There are several reasons. First, effects of grafting on controlling soilborne diseases depend on the presence of the disease that the rootstock is designed to control. For example, grafting might not be very helpful for white mold, because current commercial rootstocks do not have resistance to white mold. However, grafting might work if the primary problem is Fusarium crown and root rot, as most commercial tomato rootstocks have resistance to this disease. With that said, it is very important to look at the disease resistance profile before deciding on the rootstocks. Second, grafting effects on improving yield depend on factors such as scion and rootstock cultivars, cultural practices, and planting densities. Most growers use a very vigorous tomato rootstock such as ‘Maxifort’. Most tomato varieties grafted onto ‘Maxifort’ have more leaves and stems: plants grow bigger. In this scenario, if we have a good pruning and trellising system (in case this is an indeterminate tomato cultivar), control foliar diseases well, and place plants wide enough for the extra growth, it is very likely that grafted tomato plants will have higher yield and a longer harvest period compared with non-grafted plants. After growing tomatoes for many years, I am sure most of you have established a tomato production system that works best for your own farm. However, this system (pruning, trellising, densities, fertilizer and water, etc.) might need to be adjusted with the use of grafted plants. We do not have all the recommendations regarding the best cultural practices for growing grafted plants yet. Research projects are underway. 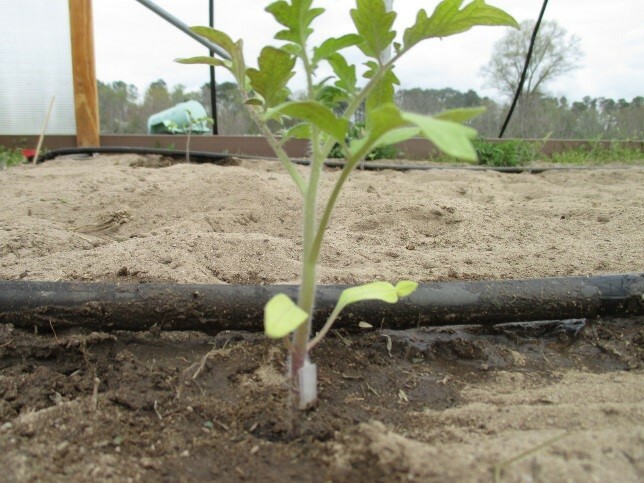 We would like to also encourage you to do an experiment to find out whether grafted tomatoes work for your system. In conclusion, I would like to annouce that we are going to have a vegetable grafting workshop at the Indiana Horticultural Congress in January. If you are interested in tomato grafting, please come to our workshop, where you will learn everything about tomato grafting, and have the opportunity to graft tomatoes by yourselves We are looking forward to seeing you at the conference.